It is no secret that America is home to perhaps the largest variety of beers in the world. More than 7,000 small and independent craft brewers call the United States home, and they have great beer bars to thank for helping educate beer lovers about what makes their beers so special. CraftBeer.com’s Great American Beer Bars 2019 highlights dozens of the unique, passionate and community-focused beer bars that work in partnership with brewers to serve the nation. Each of these beer retailers brings a unique approach to our favorite beverage. CraftBeer.com is proud to present you this year’s list of beer bars to seek out on your beer travels. Congratulations to this year’s winners of CraftBeer.com’s Great American Beer Bars 2019. JL Beers is locally owned and operated with a staff that is friendly and knowledgeable about craft beer. Pair a local favorite, Drekker Broken Rudder, with one of JL Beers’ burgers made with the freshest of ingredients and hand cut fries for an All-American classic combination. While JL Beers won the title of best burger joint in ND, the shack serves up a mean brew, too. The impressive beer selection ranges from robust Belgians to a hot beer cheese dip accompanied by crunchy chips. We’ll take another round of both, please. Is there a region of the United States more in love with the burger than the Midwest? The endless, snowy winters mixed with summers that demand plenty of “make hay while the sun shines” indulgence combine to create the perfect year-round atmosphere for burgers to dominate the scene. The Midwest is where burgers met their crazy, overblown, and delectable potential as a medium for getting calories into the body at the highest rates possible. As a result, the region is home to some of the cheesiest, heart-stoppingest, gargantuann riffs on the genre ever created. So let’s dive headfirst into a whole pile of great burgers where the blasphemous words “too much” are never uttered. These are our picks for the best burgers in the Midwest. Okay, we know JL Beers is a chain with spots in Minnesota and South Dakota too. But, goddamn if their burgers aren’t the best around in their home state of North Dakota. Pillory us for choosing a chain all you want but we dare you not to love the burgers at JL Beers. JL prides itself that “all of our ingredients come from someone’s backyard.” That care and localvore attitude translates to a great burger. The meat is freshly ground. The buns are a house recipe. The bacon comes from around the corner. 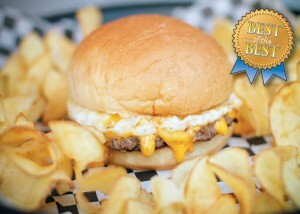 The Humpty Dumpty burger is their award winner — with an excellently cooked runny egg on the classic cheeseburger. The real star, for us anyway, is the Not Just A Nutter Burger with a healthy smear of peanut butter accompanied by local red pepper jelly, diced jalapenos, pepper jack cheese, and locally smoked bacon. It’s a spicy, umami, cheesy, crunchy mess of a burger that hits you deep in the far-reaches of your burger-loving soul. JL Beers is a local Downtown Bismarck establishment that offers a large selection of craft beers and a menu of made-to-order burgers, fresh cut fries and chips. They may be small on space, but are BIG on everything else. They’re BIG on burgers. They were voted one of the top 51 burgers in the United States by USA Today and have received many other awards to date. Their most notable burger, The Humpty Dumpty Burger®, has a fried egg and cheese on it and is considered a rite of passage by many loyal JL Beers fans. JL Beers is BIG on beer. They feature the most complete and unique beer selection in the area with 40 beers on tap and an impressive can and bottle list. Their offerings include everything from domestic styles to IPA’s to barrel-aged beers and cask ales. JL Beers has a free mobile app that showcases their current tap beer list, event information, tasting notes, and even allows guests to vote for the next beer on tap. JL Beers is BIG on service and their guests’ experience. Their beertenders are friendly and knowledgeable about beer; their cooks take pride in their speed of service, quality of food, and open kitchen design. If those weren’t enough reasons to stop in, then make sure to grab a seat by the fireplace on their patio or drink your beer under the hops growing overhead! We hold JL Beers in the highest regard for food, beer selection, and service. 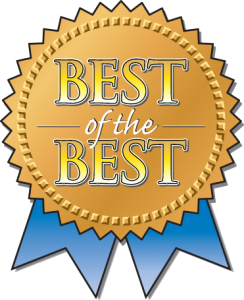 Congratulations on being a Best of the Best Winner four years straight! 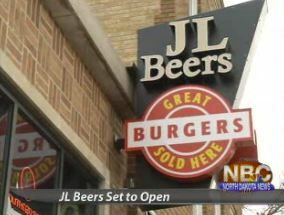 JL Beers is located on 3rd Street in Bismarck. Stop in for a Humpty Dumpty Burger and a beer! America is home to some incredible drinking spots. We teamed up with Foursquare, the city-guide app for discovering new places, to put together a list of the top-rated bars in each state and Washington, DC, based on user ratings on the app. The list ranges from upscale cocktail bars to wine joints to craft beer bars. 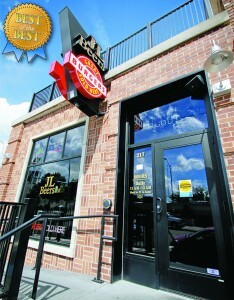 JL Beers is famous for its outstanding beer and burger selection. It has imported bottles from around the globe, mixed brew selections, and “beertails” like the Oatmeal Cookie — an oatmeal stout mixed with a splash of Lindemans Framboise (Raspberry) Lambic. We conducted painstaking journalistic research to figure out the very best burger in every state, from mom-and-pop joints to celebrity-chef restaurants and everything in between. For less than five bucks, you can get JL Beers’ delicious Humpty Dumpty, which comes with cheese and a fried egg on a soft bun. This regional chain, which originated in North Dakota, recently won best burger by High Plains Reader and other publications. It’s National Hamburger Month for those of you who didn’t know. I’ll be the first to admit that I’m sure there will be much controversy over the burgers which were crowned the “Best” in the state. However, I think that makes for the perfect opportunity for you guys to voice your opinions as to what you think the best burger is in your own state. This list was created based on accolades, reviews, and taste tests according to the good people over at Businessinsider. NORTH DAKOTA: For less than five bucks, you can get JL Beers’ delicious Humpty Dumpty, which comes with cheese and a fried egg on a soft bun. This regional chain, which originated in North Dakota, recently won best burger by High Plains Reader and other publications. Best burger I have ever had – Excellent burgers – Formed on site, great fries – Good Burger – Great burgers – Hands down delicious and reasonably priced – Hands down! – Hot ﬁre – Just tasted great burgers – Love their burgers and chips – Outstanding Burgers – SO DELICIOUS! – SO good – Tasty tasty – The beer cheese dip is great to dip the burgers in – Very tasty – Very good – Yammers – You just can’t beat the Humpty Burger! 123 Ways to LOVE North Dakota on our 123rd birthday! 123 Ways to LOVE North Dakota on our 123rd birthday (Nov. 2nd)! #11 on the list is Stop in to JL Beers and have a Humpty Dumpty burger! What’s more American than celebrating a state birthday with a delicious burger? Cheers, North Dakota!! JL Beers, a Fargo-based beer and restaurant chain, is now open in the former Bain Agency office at 217 N. Third St. The restaurant will be open from 11 a.m. to midnight, seven days a week, said partner Lance Thorson. There will be 40 beers on tap, including a lot of exclusive beers new to Bismarck-Mandan, he said. Some of these include: Grand Teton Brewing, Lucky Bucket, Mikkeller, North Coast and Delirium, as well as JL Beers brews. More information is available at www.jlbeers.com and on the JL Beers beer database mobile application. Fargo-based JL Beers has opened 217 N 3rd Street, inside the former Bain Agency building. The restaurant is known for its large selection of tap beer, offering a reported 40 different choices. They also offer in-house made potato chips to go along with your burger and beer. If you`re looking for a place where you can sit quietly alone at a table, JL Beers is probably not the place for you. It`s more likely to be a place where Cliff from the Post Office hangs out, and everybody knows your name. “We like to keep it small and a little more intimate. And it`s fun to come in here with about 22 seats at the bar. You meet somebody new every time,” said co-owner Lance Thorson. With existing locations in places like Fargo, Grand Forks and Sioux Falls, later this week JL Beers will open its sixth location on 3rd street in Bismarck. “Bismarck`s a great growing city and we`re proud to be part of the downtown environment,” Thorson said. The bar`s slogan is “Seating for 1000, 47 at a time.” And much like a 50s diner, the bar can shuffle customers in and out in less than a half hour. “Our main menu is burgers and then we have fresh cut potato chips and fresh cut french fries,” Thorson said. Thorson says they tried to hang onto some of the original character of the building, such as the brick work and the concrete beams, while at the same time, bringing in some modern flavor. With 40 beer varieties on tap, Thorson says you don`t have to sample every one down the line. You can simply take out your smartphone and find the JL Beers mobile app. No matter if its lunchtime or a Friday night, Thorson says you won`t have to wait long for a seat once you walk in the door. The bar also built an outdoor patio for the warmer months. JL Beers opens at 11:00 Thursday morning.